Hi new to forum, I am an old body style guy. The only vehicles I have ever owned are a 95 GMC and 98 Chevy both 5 speeds. Been looking around and found this truck. What do yall think. Is this an ok deal? Plan on driving it this weekend. What should I be looking for that I might possibly be unaware of. I am not idiot, just looking for advice. Well for starters it's not an SS though I'm sure that's obvious to anybody except the sales department that posted the ad calling it an SS. 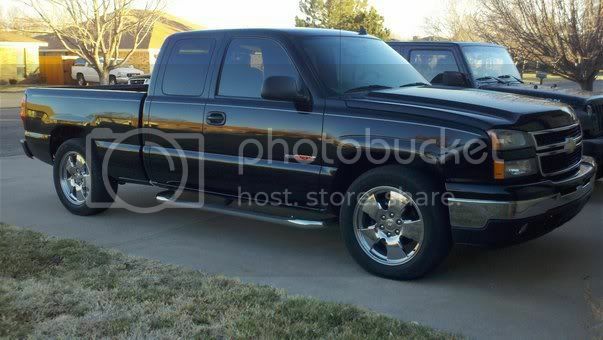 137K mile truck for 11K but it's a factory 6.0 in a 1500, I guess that's not a terrible deal? Seems to be a well-optioned truck in good condition despite the miles. I'd check it for a repaint and closely inspect the quality of the paint. I do see some questionable things like why is the air bag dark gray instead of matching the interior color? Why is it sitting on stocker wheels with no center caps? If it was a theft recovery you'd think they woulda swiped the leather seats, etc. I really appreciate the quick response. This is the email they had sent me with the RPO codes. Again excuse my ignorance to this. So this vehicle is not a SS, its just a LQ9 in a 1500. I was under the impression that all LQ9s in a 1500 were SS. PDB - ONSTAR PLUS PACKAGE: * ONSTAR SERVICE: INCLUDES 1 YEAR SAFE & SOUND PLAN * XM SATELLITE RADIO - SERVICE FEE EXTRA. 1ST 3 MONTHS INCL. U2K - XM SATELLITE RADIO - SERVICE FEE EXTRA. 1ST 3 MONTHS INCL. That was cool of them to send you the RPO list. The RPO B4V is the key here, the performance edition package. I don't know a lot about them but from what little I do know, it's essentially an SS in disguise, in other words no SS body kit/appearance package, and emblems. It's got the 6.0 engine and should be 345HP like the SS...and it's a torsion bar suspension like an SS (or like a 4x4) even though it's RWD, not AWD. (the 2006-2007 SS's are RWD as well, 2005 was AWD or RWD optional, prior to that the 2003-2004 SS's were AWD only.) Likely the transmission is the 4L65E which is just a somewhat strengthened version of the 4L60E. It may have the 9.5" 14 bolt semifloating rear axle which is stronger than the 8.5" 10 bolt. If so it will have drum rear brakes instead of disc. That's what the RWD SS's got, too. Not 100% sure here but I believe this is the truck commonly referred to as the VHO, though I'd wait for input from the VHO guys and not take my word for gospel on that. If so then the 20" chrome wheels described in the RPO codes may have been stolen, or sold off by a previous owner. They're not the same design as the SS wheels. By the way here's a VHO with the correct wheels on it, this is pretty much what that truck would have looked like except in black, and the tube steps are of course aftermarket. Wow, really like those wheels. The Vortec High Output option was first introduced in 2004 to a limited market (mainly consisting of Texas and several surrounding areas); it was available nationwide 2005. It was available for both the Chevy and GMC 1500 series trucks. This special edition package (under option code B4V) included several options previously not found on the standard 1500 model, most notably the LQ9 6.0 L V-8 engine (the same used for the Silverado SS, the 2005-2006 GMC Denalis and the Cadillac Escalade). The LQ9 motor was rated at 345 hp (257 kW) at 5200 rpm and 380 lb⋅ft (515 N⋅m) of torque at 4000 rpm, which was the same specifications shared in the SS models. The B4V package could only be ordered on extended cab standard box 2WD trucks. They were all built at the Canadian assembly plant and were equipped with the Z60 High Performance suspension package, in addition to the M32 = 4L65E transmission, GT4 = 3.73 rear gear, and G80 Gov Lock as standard equipment. The 2004 models were equipped with the standard 10 bolt 8.625 rear end. The 2005 models were upgraded with the larger 14 bolt 9.5 rear end under RPO option AXN. The package also included one style of the newly introduced GM 20 inch wheels installed from the factory. This marked the first time the LQ9 engine was available for a two-wheel drive application. Unlike the previous years with the SS Package, you could order the interior combination in anything from basic cloth to fully loaded. There were also more exterior color options available with this package. In 2006, the Vortec Max trailering package became available. The Vortec Max package was added to the option list with an array of similar features and new badges, and at its core retained the LQ9/4L65-E powertrain. However, the Vortec Max package differed from the Performance edition in that it also came with a variant of the Z85 Handling/Trailering suspension, as well as 17-inch wheels and tires under the option code NHT (and was available on 4x4 models in addition to 4x2 trucks) versus the Z60 High Performance Suspension and 20-inch wheel and tire package of the regular B4V (which was limited to 2 wheel drive trucks). This was because the Vortec Max package was intended for max trailer towing, while the Performance Edition was intended more for customers who wanted the Silverado SS mechanicals without the visuals of the SS. It was also made available (in addition to the extended cab) in the light duty 4 door crew cab models. Towing capacity with the VortecMax Trailing package was 10,800 pounds. Went and drove it today. It was pretty nice. I printed out vehicle information kit from the GM heritage center to prove that it wasn't an SS and they didn't even want to look at it. I made an offer and they said they were already selling it at a loss at 10K. Claimed they had 10,800 in it already. No way right. I took a picture of the mileage when I got in it and it only has 9 more miles from the picture in the ad.. which tells me that no one but maybe one or two people have driven it.. they let me have it for 2 hours and I put 15 miles on it myself. Took it to mechanic I know to look it over. If they were closer to me I'd swing by and show them what an actual SS is. I say the truck was in an accident by the last owner. Front bumper looks tweaked and the front airbag might have activated. Stocker wheels where replacements for rims the truck had before it was traded in. they said they were already selling it at a loss at 10K. Claimed they had 10,800 in it already. No way right. I can guarantee you, if that truck was taken in as a trade. They have no more than $2500 into it. Thanks for the input everyone. Yea I offered 7k.